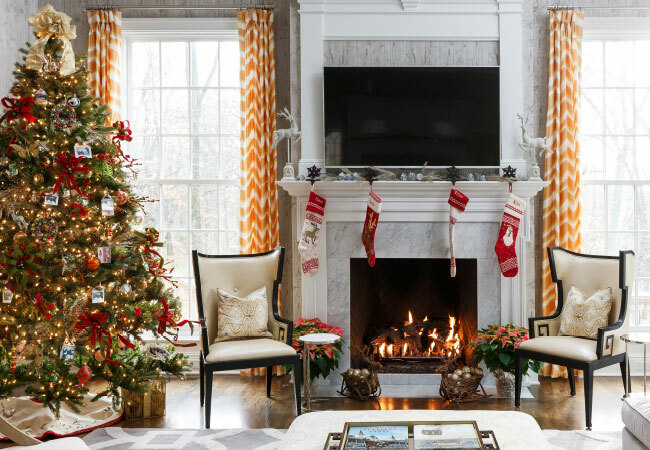 Photos by Tim Furlong, Jr.
Just in time to inspire your own holiday decorating, Lee Robinson, master of posh yet personal design, dressed up a client’s home for the holidays. Watch him add some swag and abandon the Christmas décor clichés. “We wanted the foyer to be grand yet youthful and we also wanted to use marble, so we opted for a modern way of handling it,” he says. 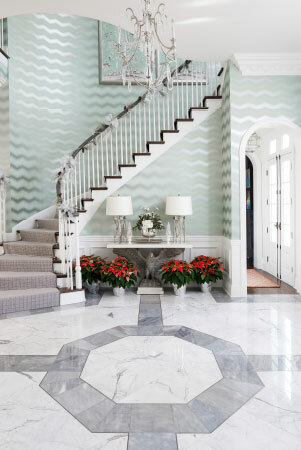 The foyer greets guests with its smooth marble flooring in a light gray and white hue peppered with silver strips that give the space an extra pop. Robinson chose an octagon motif inlay for the center of the design. 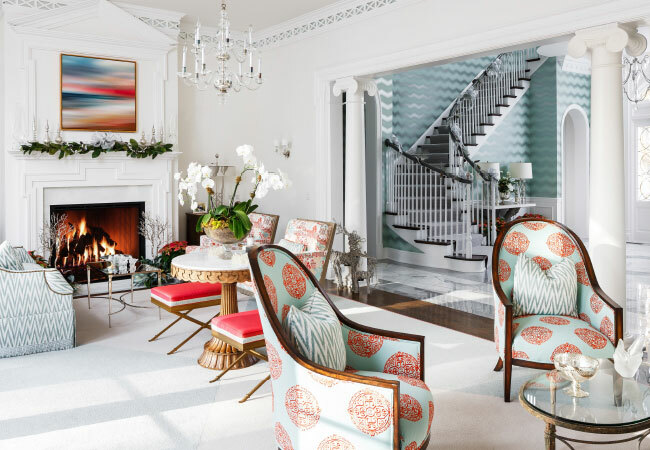 Walls are clad in a Schumacher covering from Mary McDonald and feature fabric pieces framed in silver leaf frames— also Mary McDonald. Festive poinsettias find a home under the modern version of an old Georgian eagle table created by designer Thom Filicia that showcases stylish lamps and silver holiday ornamentation. An elegant chandelier illuminates the space while small boxwood wreaths complement the Julian Chichester mirrors that line the walls. Lee designed Georgian headers above the doors that add another striking, custom detail. 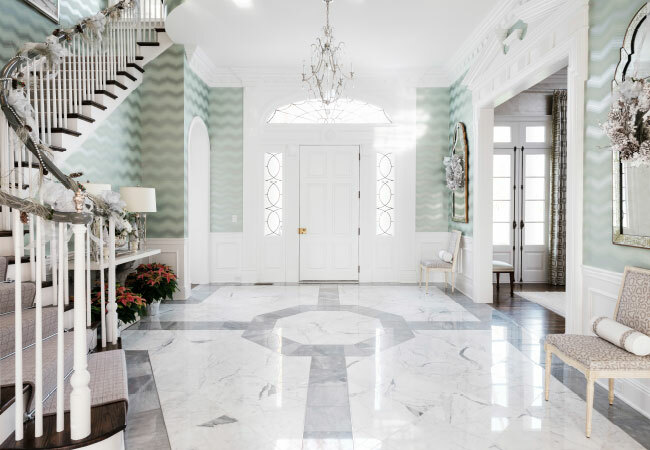 Aged mirrors reflect one another at each end of the transverse hallway with pedestals featuring lighted alabaster urns containing bold flower arrangements that are changed out seasonally. In the dining room, custom wainscoting panels with mirror inlay add a touch of drama and sparkle. 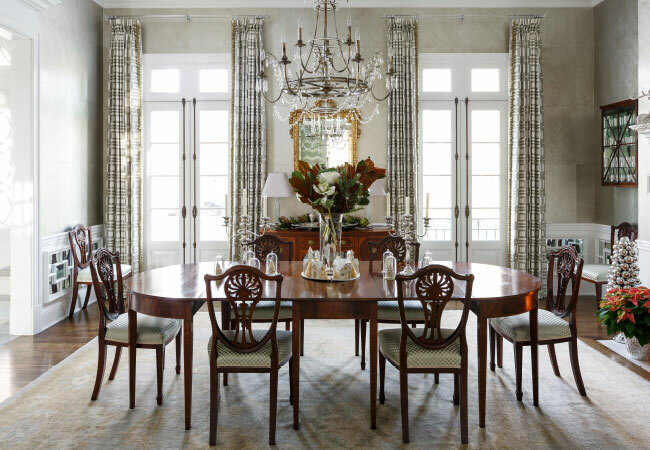 Banquettes provide extra seating when the family is entertaining large groups. The walls are Stark – a hand-folded origami pattern with sterling silver leaf. Robinson echoed the palette by incorporating silver ornaments into the greenery he placed on the mantel. 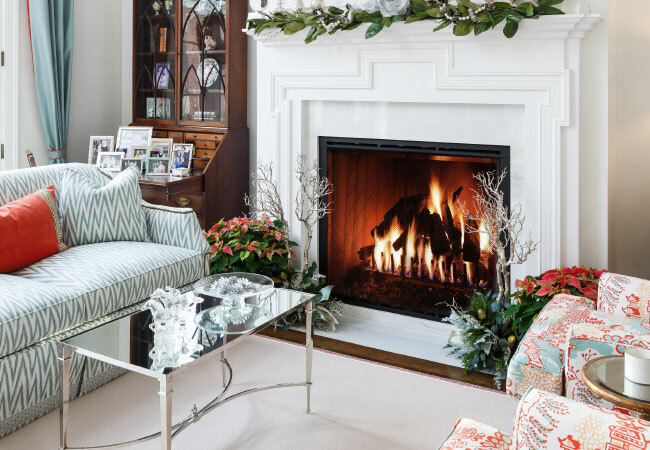 “I like to incorporate live greenery into holiday décor whenever possible,” he says. The farm-to-table arrangement including kale that has been sprayed with just a touch of silver adds a festive twist to the dining room table. 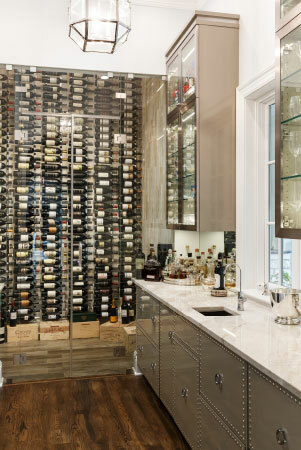 The study is a breathtaking room full of surprises. 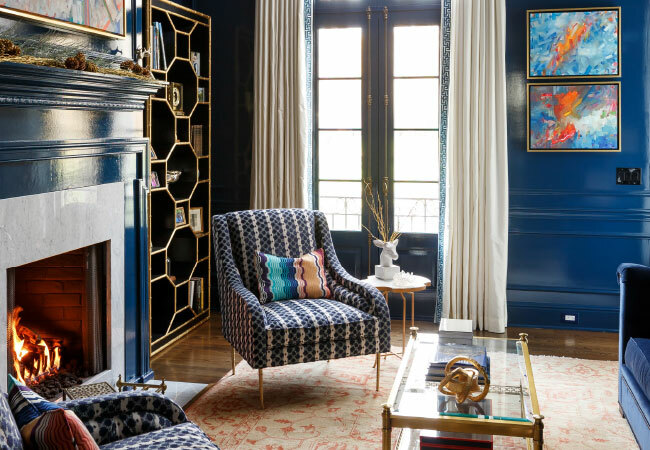 Lacquered blue walls command attention, while Mary McDonald club chairs with stilettos-like legs and a velvet sofa adorned with Missoni pillows form a cozy conversation pit. Instead of built-in bookcases, Lee opted for matching Celerie Kimball shelves to flank the fireplace and accommodate books and collectibles. 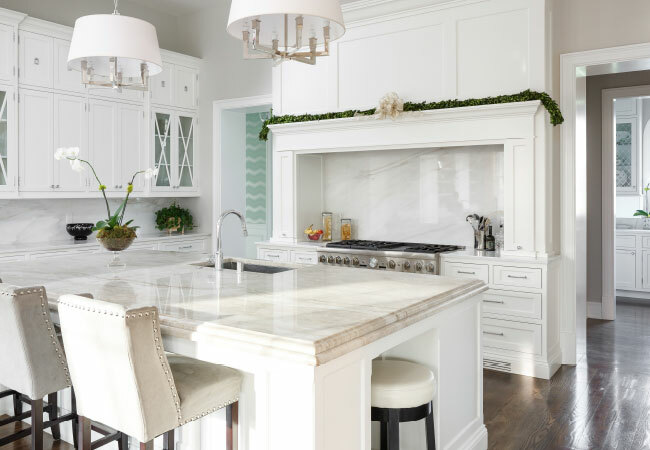 We asked Lee Robinson to share some of the essential design and holiday décor sources he used in decorating this stunning home.